MORRISTOWN, N.J.— “Retail clinics have become mainstream and are helping expand access to high-quality and affordable care,” according to Tine Hansen-Turton, executive director of the Convenient Care Association. Hansen-Turton delivered her remarks in a presentation titled “The Value Proposition of Convenient Care and How Retail-based Healthcare Clinics Can Build a Culture of Consumer-Driven Healthcare” at the first annual North American Conference on Consumer Healthcare and OTC Medicines, held here recently. 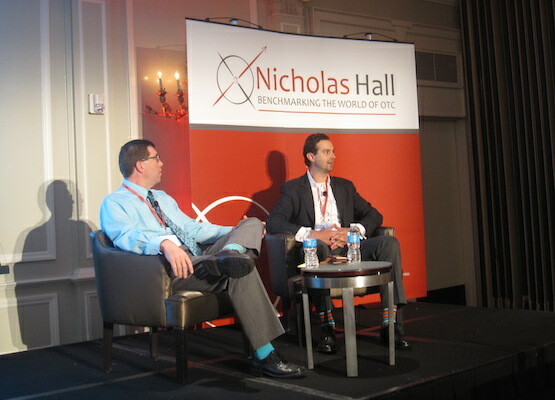 The Nicholas Hall Group of Companies and Everything Health LLC hosted the two-day event that brought together leaders in the health insurance, pharmaceutical, consumer health care, retail, policy, research and consulting ­industries. Walmart’s Jamie Grace and Alex Hurd discuss health care solutions. Hurd pointed out that rising health care expenses represent a growing burden for the American consumer. “With all that is going on in health care today, we are on a pretty bad trajectory and we need to provide consumers with some alternative solutions,” he said. “Walmart continues to put customers first and support them by focusing on easier access to high-quality care and products at lower costs. He added that a new partnership with Quest Diagnostics offers customers the ability to get lab work done conveniently, among other health services. The program, which will be available in about 15 Walmart locations by the end of the year, provides lab testing and, eventually, a broader range of health care services. Jamie Grace, senior director and merchandise manager at Walmart, also talked about the Wellness Day program and the work it is doing with the American Diabetes Association to offer support to people who are at risk for developing type 2 diabetes. The event also included a panel discussion on “Establishing Collaborative Relationships with Payer, Retail and CPG Entities to Put Consumers First and Deliver Superior Outcomes.” The panel included Colleen Lindholz, president of The Little Clinic and Kroger Pharmacy, along with Chris Jobes, director of retail health and wellness at Johnson & Johnson Consumer Products Inc. (J&J).